We have here today a quick giveaway for $50 PayPal/Amazon. You have through the end of the weekend to enter to win. Open worldwide. Ends 5/31. Good luck. For THREE Days ONLY we are offering this Flash Giveaway! 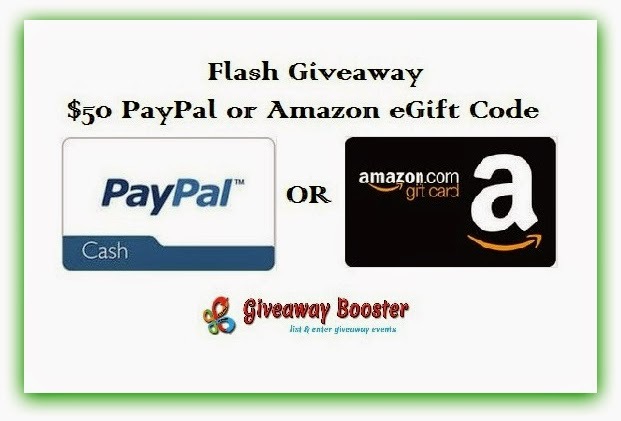 One lucky reader will receive $50 USD Paypal Cash or Amazon Gift Card!! This giveaway is for THREE Days Only! Enter Now! We are making it easy peasy to enter! Just use the form below. Remember, this giveaway ends at 11:59 pm on May 31, 2015! Tell your friends so they can enter, too! Disclosure: This giveaway is organized by Giveaway Booster.com. The participating bloggers were not compensated for this post. If you are a blogger and would like to join in this giveaway event please check this post on Wednesdays to sign up to join. We are not associated with any of the companies named above. No purchase is necessary to enter. Void where prohibited by law. The odds of winning are based on the number of entries received. Must be 18+ to enter. Confirmed Winner(s) (by Random.org) will be contacted by email. Winner(s) have 24 hours to respond before a new winner is chosen. No purchase necessary. Void where prohibited by law. My blog is not responsible for product shipment/delivery. This event is in no way administered, sponsored, or endorsed by, or associated with, Facebook and/or Twitter, Google, Pinterest. This disclosure is done in accordance with the Federal Trade Commission 10 CFR, Part 255 Guides Concerning the Use of Endorsements. Entrants must only enter with either one email address, IP address and/or Facebook account, anyone found violating these rules will be disqualified. It is at the sole discretion of the admin of the giveaway if the winner has met the rules or not. If you have any questions about this giveaway please email Tina at branchpropromotions@gmail.com. I plan on visiting the water parks with the kids a lot this summer. We're going to a couple baseball games, going on a road trip to visit family and spending time at home. Lots of camping and hiking. We are visiting the zoo in Asheboro NC! Not much, just gardening, trying to get my grass weedless. Pool time and a few weekend trips to see family! I will be getting ready to move and hopefully sneak in some fun time too. We will be going to see our new grandson. We will be doing some home improvement projects. Hopefully our weather will get warmer so I can spend time on my deck! I live on a lake and have lots of weekend company which I love so hopefully June will be beautiful and my family will come to visit and enjoy my home. I will be working on my yard this weekend. Many trips to the beach with my family. Don't know if it will be fun, but have a house to get ready to sell! Planning for a family vacation! We are having a neighborhood potluck - always a lot of fun! I love the start of June because I get to start my summer hours and work a lot less and get to go camping on the weekends. I plan on putting a tent up in my backyard and have my grandkids come over camp out with me. I think it would be fun and a learning experience for them. Since we are retired, we normally don't plan things in advance. Thinking we might take a mini-trip and rent a condo on the beach...might happen in June, might night...whenever the spirity moves us. I'm taking trips to Boston and NYC in June - so at least two weekends will be fun-filled. Also starting a garden and joining a running club this month. Oldest sons graduation from HS. We'll be having a small party. I have lots of company coming, a camping trip and various activities for the kids in June. None yet, I need to make some. I'm teaching a class in June, and am looking forward to it. Thanks for a great giveaway! The kids are still finishing school and we have one graduating. Then we will take it easy for a while. i am going to vegas for an overnight trip! yay vegas. I want to do some yard improvements and have lots of meals on the deck. I plan to go rock hounding in the west desert of Utah. I'm going to Louisiana to visit family, and I'm going berry picking. A few family bbqs and a wedding to attend in June! I'm going to be performing in a production of Othello! I plan on going to Six Flags and having a family cookout. I plan on getting back to my Zumba classes. My birthday is June 7th so Im hoping to have alot of fun that day! We will be staycationing the month of June! We are going to the beach! My plans for June are attending lots of my grandsons' little league games. I plan on tackling my junk room so I can get it cleaned out. Sadly, work deadlines mean that June will be busy with overtime - no fun for me! We are planning to go to our local water park in June! Decluttering rooms and painting the bedroom. Going to go on picnics, have BBQ's and relax. The kids will be starting some fun classes in the month of June and I will be starting a fitness routine. Lots of BBQ's and outside fun, camping, swimming everything I have been waiting all year to do. Haven't really got much planned for June. Kids get out of school on the 17th so will probably do something just haven't decided. No plans other than to hopefully take some nice outdoor photographs. My kids are in 3 basketball camps in June. We are going to Disney. We are going to a cabin for a week! I plan on going kayaking. Working and visiting with my stepbrother. We have a trip to Mine planned. We plan on doing some camping. I'm planning on stepping up my fitness gAme and reading a lot! I plan to have a barbecue.